As my kids get older and my duties as a mother change, I'm asking myself this question almost every day. What DO I want my legacy to be? One answer that has been ringing true with me recently is that I want others to say that I offered an astonishing change and depth of perspective that helped at least one person to live their life in a more fulfilling way. I think about what I've offered the world so far, and I feel as though I've done a decent job (certainly not 100%) of creating that legacy online. Through social media, blogging, videos, and audio recordings, I've shared thousands of insights that, if feedback given is true, have positively shifted the mindsets of many people. But .... offline? It's a different story. It is fairly easy for me - a trained-extrovert, actual-introvert - to speak openly online. When I can pause, consider my thoughts, and "speak" without distractions such as the expression on another's face or conversations happening off in the corner, I speak in a manner that is more connected to the truths I hold on the inside. When I'm speaking to almost anyone else in person, it has taken me years to feel confident enough to speak my truths even when I'm invited to do so. I used to stumble and stammer and use countless qualifiers and laughter-as-filler because I wasn't used to speaking in such a connected manner. My mind was still chattering away with the responses I felt I was expected to give, and it was simply too noisy to hear what I really wanted to say. And let's be honest - most of the time, you aren't specifically invited to say what is on your mind. A conversation stems from small talk and flows along, and it is up to you as to how much depth or direction you insert into that conversation. As with most things, the older I get, the less acceptable it is for me to live in such a disconnected manner. When I think about my legacy, if I'm unable to speak the wisdom that is within me ... how am I supposed to offer life-altering perspectives to ANYONE? So how am I challenging myself to deal with this? One (awkward) conversation at a time. My husband worked on father's day. I'd been pondering how to celebrate for him when I had one of those you-can't-ignore-me-no-matter-how-much-you-want-to ideas. I was rather ticked at myself for having thought it up, because now that I had, there was no way I was getting out of it. My idea that eventually turned into reality? My husband works at a pharmacy in a grocery store. 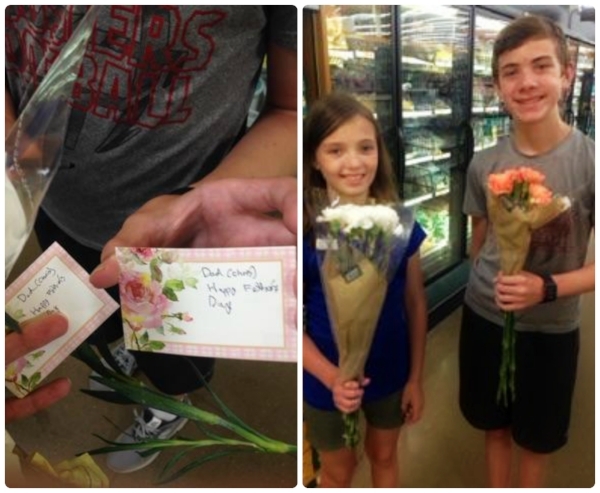 On Father's Day, the kids and I went to the floral department at his store and purchased carnations. We then hid an aisle away from the pharmacy where we couldn't be seen from his viewpoint. One by one, the flowers arrived. Needless to say, it was a fun surprise that made my husband blush. And after nearly a dozen very awkward conversations, I was just a teeny bit more confident in my ability to start the next one. Our son's birthday party was a few weeks after Father's Day. He'd made big plans to have a pool party, but a rain shower on the day of caused a last-minute scramble to make other plans. With online searches (bless Google), I quickly pulled together a mall scavenger hunt list for him and his friends. Due to even more last-minute cancellations by a few guests, the teams were left a bit uneven by the time we got to the mall. So I decided to participate on a team with my daughter (without the option to win, of course). This scavenger hunt required a great deal of talking to strangers. That seemed like a humorous idea .... until I had to participate. But remember: as we do one thing, so we do all things. Those conversations I'd had in the grocery store just a few weeks back had primed me for this situation. It wasn't EASY, but it was just a bit EASIER. From store employees to random shoppers, I faced my fear time after time and checked off list item after list item. 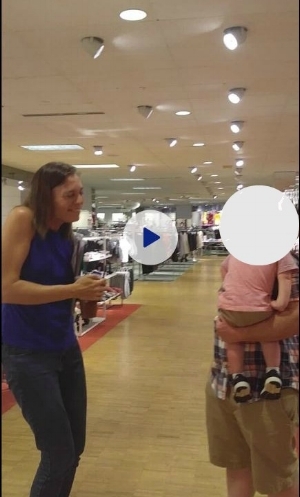 I kid you not: I even sang "twinkle-twinkle little star" to a random little child while his absolutely wonderful and accommodating parents looked on. Obviously, both of these situations introduce very atypical conversations. But if I can start a conversation with a complete stranger, think of how much easier it will be to redirect a conversation with a friend....or to speak my truths in a less awkward situation. Have a reason / excuse for initiating the conversation in order to get the ball rolling. In the situations above, it was for father's day and a scavenger hunt. Want to try this on your own? Create a survey of interest to you that you plan to post online and ask random passers-by to respond anonymously. Play a game with your kids (kids are always a great excuse) of who can talk to people whose names begin with each letter of the alphabet. First person to find all 26 people wins. Copy the scavenger hunt idea. Be open and honest about your feelings. When approaching a stranger, don't hesitate to start with, "Pardon me, I know this may seem odd, but...". When redirecting a conversation with a friend, admit, "So I know this is jumping topic, but I've been trying to speak more about what is on my mind". Go with the flow. Pay attention to the energy of the conversation. Sometimes the conversations will be short; sometimes, you will be invited into a longer, in depth discussion. As you are learning to speak your truths, pay attention to this push and pull. Sometimes more words are needed. Often, silence is what provides the space for much needed contemplation and the openness for the next words to emerge. Go in with intentions of kindness and playfulness. Of course, not every conversational topic will be light, but every conversation can be carried out with intentions of kindness. With the situations above, I always had a smile when approaching any stranger, and followed any requests with gratitude (whether or not they participated). Curiosity is a wide-open door to walk through when starting or redirecting conversation. If there's a topic you're longing to speak about, try asking - with honest curiosity - about the other person's feelings on the topic. Let the conversation flow into a mutual exploration. Fail as many times as possible. I've read this suggestion before in a few places, mainly in regards to pursuing one's passions or goals. I figure it applies to honest speaking as well. Trip over your words. Say what you don't mean to say. Linger in awkward silences and not-so-nice responses. Allow the squirmy feelings within to transform into an energy that carries you right into the next conversation. If you always succeed at easy conversations, you'll always remain afraid of the potential for the next bad one. Only through "failure" will you gain the true confidence to go after the next conversation and the next one and the next. Wherever you begin - with a spouse, a friend, an acquaintance, or a stranger - and however few or many words it may be, may your next conversation be deeply fulfilling.